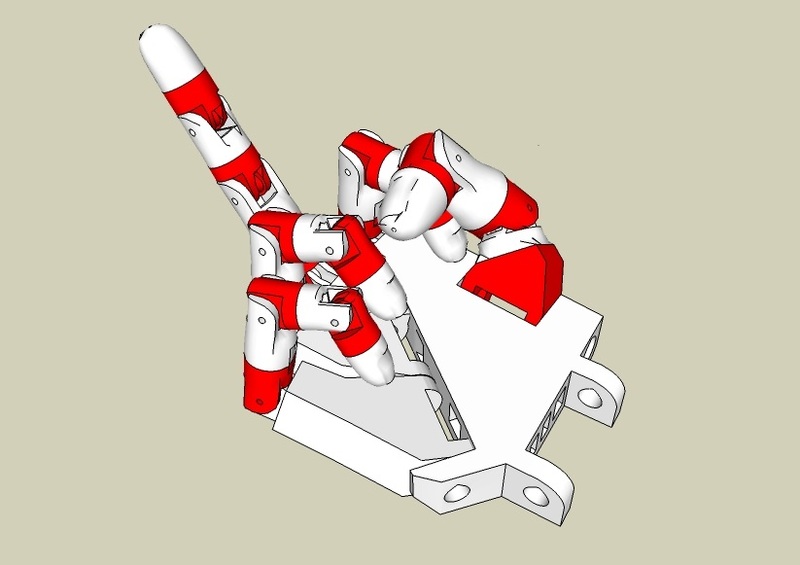 I have made InMoov's right hand in SketchUp. Those that have seen the 3D PDF allready know that. There's a lot of rotation axis in the hand so I needed to have an easy way for posing it. 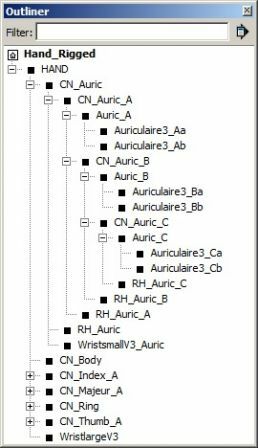 With a clever group hierarchy (parent/children relation) it's possible to achieve a simple rigging system. But of course this system doesn't allow for Inverse Kinematics (IK) because it's only strictly hierarchical. So for animation purpose it wouldn't be well adapted. But I'm only doing posing in SketchUp... It's not an animation software. At each rotation axis I added a "rotation handle" with a "default angle" and a "max angle" marks. And I put all my handles on a different layer named "Rotations" so I can easily hide them by just hiding the layer. In the "Ouliner" window on the left, you can see how my hierarchy is done. I have expanded the hierarchy of the smallest finger (Auriculaire3) so you can completely see it. Each nodes with a name starting with "CN_" are my "Control Nodes". And each nodes starting with "RH_" are my "Rotation Handles". Each "Control Node" contains the corresponding geometry of the model and the corresponding "Rotation Handle" to control it. the rotation handle to control it "RH_Auric_C"
Right hand rigged with its "Rotation Handles"
With such a setup I'm able to pose the hand very easily and in a very short time.